Before I make a review of a product like the new GoPro Hero 7 Black I like to have a good amount of time to use and test it in real-world scenarios before I make any kind of judgment. This turned out to be especially true for the Hero 7 Black because my opinion on it has changed quite a bit since those early first few days. If I had made a review too soon it would not accurately reflect my thoughts on this camera after a good amount of time using it. I would also like to point out that I purchased the GoPro Hero 7 Black myself, It was not sent to me as review gift from GoPro. I am not part of the “GoPro Family” or a GoPro influencer as some call it. This is important because I spent my hard earned money on it just like you did or will be doing. I expect good value for my money and this ensures a good honest, accurate and fair review. Early on in the Hero 7 release, there were reports of batteries not charging completely, GoPro freezing while charging and firmware update issues. I can’t really comment on those issues because I didn’t experience any of that with my unit. The only one time issue I had was during the initial firmware update via the GoPro app it did fail, however, it was successful on the second attempt. I must also say I have experience firmware update errors with every GoPro I have owned since the Hero 3 series. Early on in the release of the GoPro Hero 7 Black I was not really sold on the value of upgrading on what essentially seemed to be just a firmware upgrade on a camera that for the most part was identical both inside and out except for the new black finish. The new features that GoPro was promoting seemed very interesting but was it worth spending $400 US or $529 Canadian. I spent the first week with my new GoPro testing out all the new features including HyperSmooth (Stabilization), TimeWarp (Hyperlapse), SuperPhoto (HDR Photography). I also spent time testing out the dynamic range and audio properties of the new Hero 7 Black and I must say it did not disappoint. To address the issue of the Hero 7 just being a firmware update, from what I have read the Hero 7 Black has an extra gig of ram and newly engineered microphones to help make these new features and changes possible. So let’s break it down and go over all the new changes and what I think of them. Form factor/Cosmetics: I am not a fan of the new black material they are using as the finish. I find it looks a little cheap and does not have the feel or look as a premium product should. I much preferred the finish on the Hero 5/6 Black. I have found it to scuff easy and because of it rubbery finish, it always has lint and debris stuck to it. I am not sure how the finish will hold up over time. Now really how a product performs is more important than cosmetics, but when you spend a lot of money on gear you want it to look good and stay looking good over time. HyperSmooth Stabilization: GoPro is calling the Hero 7 Black a gimbal killer with its new HyperSmooth technology, now I don’t know if I would go as far as to say that but I definitely feel there is some merit to their statement. The stabilization on the Hero 7 Black is truly incredible, leaps and bounds ahead of the Hero 6 Black. There are those times when a stabilizer will do a better job, but for me, I can see that 80% of the time in scenarios where I would want a gimbal to film I really don’t need it anymore…it is that good. A gimbal will always give you a little more of a polished look, however not having to lug a bulky gimbal around and still able to get gimbal like footage is alright in my books. Gimbals are delicate and can be damaged easily, not to mention there are those situations where you just can’t use a gimbal. One big improvement of the HyperSmooth stabilization on the Hero 7 Black is the fact that you can now stabilize 4k 60FPS footage, this is huge for me as I primarily film in 4k60FPS. I am extremely pleased with the stabilization on the Hero 7 Black, so much that I feel this is well worth the upgrade cost alone. One downfall of the Hero 7 Black Hypersmooth is that it does not produce the best results in low light conditions. TimeWarp/Hyperlapse: Another new feature of the Hero 7 Black is it can now create TimeWarp videos also known os hyperlapse videos. This is really is a useful and welcome feature of the Hero 7 Black. The TimeWarp feature works very well and can produce some visually stunning hyperlapses all with the push of a button. Not only does it work well, but it also is super easy to use the TimeWarp feature and that is very important, nobody wants to spend to much time trying to set up shots. With the Hero 7 Black, you just press the shutter button and go. In Past GoPro models to film a hyperlaspe was quite a time-consuming procedure, you had to have good editing skills and patience as well as it was not an easy task. Timewarp videos are a nice way to shoot interesting b-roll footage for your videos and is a very welcome addition. SuperPhoto (HDR): To be honest I was a little disappointed with the SuperPhoto feature (also known as HDR) on the Hero 7 Black. When it was first rumored that the new Hero would be getting an HDR feature I was quite happy as I love to shoot HDR photography on my DSLR. Traditional HDR photography is when the camera shoots 3 photos with 3 different exposures, one overexposed, one underexposed and one normal this is called bracketed photos. The photos are then merged together in software into one photo and it leaves you with a nice evenly exposed photo with good detail in the highlights and lowlights. Most smartphones and even the Hero 6 Black had this feature. However they did not save the bracketed single photos, you are only left with the finished merged photo. I was hoping the Hero 7 Black would allow for the saving of the individual bracketed photos so the user can do their own HDR processing, but unfortunately, that is not the case and you are only left with the finished HDR image. I do hope this is changed down the road as I would love to edit the HDR photos myself. 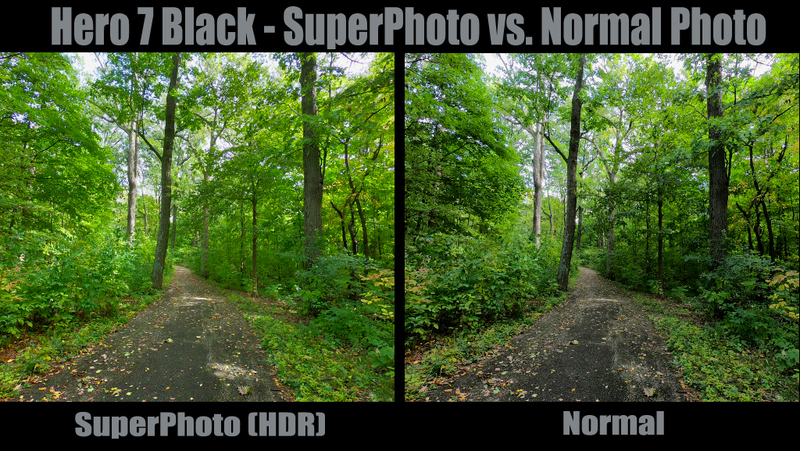 Now when it comes to the quality of the processed HDR or SuperPhotos I personally feel it needs some work. I find that there is something off about the SuperPhotos I can’t quite put my finger on it, I think there is not enough shadow and contrast. I find photos shot in regular mode look better. This is just my personal preference and others may feel differently. If you look at the example below you can see what I am referring too. A comparison of the GoPro Hero 7 Black SuperPhoto versus a normal photo. Personally, I find the normal photo looks better. The SuperPhoto (hdr) lacks contrast and depth. No editing has been done to either photo. Some other things to note about the Hero 7 Black is the newly designed menus. I really like how GoPro set them up. It took a few days to get used to the new layout but I find they are simple to navigate and well organized. GoPro has finally added a photo timer to the Hero 7 Black. This is a long overdue feature and for the life of me, I can’t understand why it took so long for such a simple little feature. No more having to yell at your GoPro to take a photo when shooting a selfie, no more funny looks from people around you. GoPro has added live streaming. I am not going to get into that in this review as it really is not a feature that interests me. I did take a quick look at it and it seems easy enough to set up if you are interested in live streaming with your GoPro. One last feature I should mention is you can now easily shoot in portrait orientation. Its one of those things that you will not use every day but when filming for some social media platforms it definitely is handy to have. This year’s launch of the GoPro Hero 7 series was a little lackluster compared to years past, no launch event with Nick Woodman enthusiastically showing off his latest cameras and gear, and no launch video which many look forward to watching. Not a lot of hype built up like in years past and I think was due to the fact only mildly interesting hardware was released this year, we didn’t even get any new GoPro accessories this launch! With all that said I am quite happy with my Hero 7 Black purchase. If you have a Hero 5 Black its is definitely worth the price to upgrade, however, if you have a Hero 6 Black its not such an easy decision. Personally, I think it is worth the upgrade just for the stabilization alone. If you’re on the fence about purchasing the Hero 7 Black if you already own the Hero 6 Black. You could always sell you old GoPro online to help offset the cost of upgrading. You can watch our Hero 7 Black 30 days in review on YouTube. We include sample footage and talk about the new features. I hope you enjoyed my full in-depth and comprehensive review of the GoPro Hero 7 Black.